Posted By:Unknown | At:8:57 AM Be the first to comment! 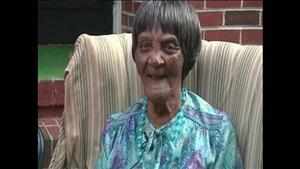 WSAV - For decades, 108-year-old Joanna Jenkins of Beaufort, South Carolina has watched elections come and go. Now she is using her right to vote for the first time. "She's just excited, she wants to vote this year, we were looking at the election, and as the debates were going on she decided she wants to vote all of a sudden. She just wants to vote, she wants to vote and is excited to vote," said her cousin, Shirley Lee. Because she can't read or write, and does not have a state issued ID, her family didn't think she'd be eligible to vote, but thanks to help from their family doctor and the Beaufort County Board of Elections, she's registered as an absentee voter. Elections officials say her case is extremely unusual. "It's incredible, she grew up in a time when Jim Crowe laws were fully in effect, and minority voter suppression was the norm, and to vote was a fight not a right and she is a great example to others that it's never too late to vote and you should always exercise your right," said Director of Elections Scott Marshall. "She was telling everybody, everyone that came by to visit, she was just telling everybody, I'm gonna vote! I'm gonna vote! So this year, she's gonna do it," said Lee. For Joanna, there's no better time than now to start her voting record...and who gets her vote? "Obama!!" she said with a smile.